Need some advice on purchase of a WS6. I've started this great search for a WS6 back in April. I've always wanted one since 98 and seen the new TA's at the dealership when purchasing my truck and my co-signor told me NO when she seen the sticker price (I was 19 at time and the TA was $28K). Over the years I purchased cheap hot rods and fixed them up, made them faster, whatever, etc.., and sold them and moved on to the next project. I bought a 95 bright red LT1 TA, slicktop, tan leather, loved it. Then catastrophe struck it and my ex husband made me sell it. John Doe (legalities, not actual name) has an ad on craigslist for a bordering state. I call him, he still has it. His advertisement states car is clear and he has title in hand, blah blah blah. I ask for better pics, he emails them. Im in love. I want it. So I call my bank that Thursday, September 9th, loan is approved, all good to go, need John Doe to fax me copy of title. He faxes me the "title receipt" (Texas), bank says that wont work, need actual copy of title. Apparently John Doe did not get the title put in his name immediately after purchase and did it after I contacted him. So we chit chat back and forth the last week and half waiting on title. Texted him Wednesday asking if the title came in and he texted back, "hasn't been fourteen days yet". Should I just wait this out and quit being a big baby? I'm in love with this car. I know i'm being impatient, but crap, really. I wanted it for my birthday, but that was three weeks ago already. I've bought and sold cars a hundred times over in the last ten years, but this one is eating at me. Can you guys calm my nerves, tell me this just happens. I don't want to lose the chance on the red TA. Last edited by jrbonds; 09-23-2010 at 10:02 AM. pass on it. titles issues are a pain. these cars are a dime a dozen. also, your link does not work. in my opinion, the window period for you to purchase this car, in what should be an easy transaction, is fouled on his end. imo, flags have been raised, and you should walk. Yeah been fighting the link thing forever now. Gave up. do you have an actual link to the craigslist post? I figured it out, photobucket has changed a little since I last used it. ok, i'll go into some more detail for you. in the state of TX, you have 30 days to title the vehicle after date of purchase. every month the new owner delays this, there is an additional $25 title penalty fee assessed when the paperwork is taken in and processed. then it will take about 2 wks for him to receive the title issued in his name from TX DMV. then he can legally sell the car. next thing, you state the milage is iffy. he can tell you one thing, but even the title can read exempt. you don't know if he drove the vehicle since he bought it. also, get the VIN# and run a carfax. this is key. you may have no clue what is hidden with this car since he chose not to title the car as soon as he purchased it. it is illegal for his to sell this vehicle without having the title properly in his name. these factors are why i say you should walk, and wait for a better car to come along. I know the mileage, its just higher than I would like, but it is no big deal considering the condition this thing is in. I already did the carfax. Just a lil perturbed that he didn't have the title. Thank you for the help. I haven't bought many texas cars, but its basically the same rules in OK.
you have every right to be skeptical when it comes to title issues. in regards to the milage, im surprised you are/were able to secure a loan for an f-body. most banks only lend going back 8yrs and having milage caps, making a 2002 just on the verge of being able to take out a loan. props to you for being able to secure one. if the milage is a concern, i suggest finding a vehicle that suits all your needs, not just a few. after all, if you are taking the time to go through a loan to get an f-body, wouldn't you want to make sure you get the most for the money? i mean, in your original post, it sounds like you are dead set on red/tan, but passed on a black one because it was an auto. what are your search criteria(s)? what are you needs/wants? what are your limits? Last edited by SSwt00SS; 09-23-2010 at 10:25 AM. As for the bank, I had to double secure it with the Trans Am and my 65 Mustang, but its a small town bank. Grandma has been buddies with this loan officer for ages. My biggest thing was 2001 or 2002 (bank issue), wanted a six speed, going threw the gears is more enjoyable for me. As for colors, well red or black was my option because black just looks mean, but then again I live in a small redneck town where everyone has a black one, pewter or dark blue. Two of my friends have a black and blue ones. 3 teenage boys have black ones and they rag on them; small town cops and I don't want to get eyeballed because another black TA. I'm finding them in my criteria everywhere, like you said a dime a dozen, but mainly "lady driven" auto's in every color of course. BUT red. Ive gotten it stuck in my thick skull I want red. Guess I could do without the tan interior. don't let mileage fool you like it did me... i bought my TA last month with only 32k on the clock (for a 96 that is SUPER low) and it has some fluid leaking issues.... it is all in how the car was cared for... you can tell from the little things... is the carpet clean or does it have stains? seats? headliner? wheels? paint? there are many things that you look at..
if i were you i'd be looking for other TAs while you wait for this toolbox to get the title and if one comes up that is as good or better then pass on this one. i can understand and relate to vehicles with body/paint issues. had that with a '95 TA i had and sold back in March. Also, fuel pumps are SSOOOOO much fun. If you are finding cars that meet your criteria, then it sounds like you have plenty of selection of which to choose from. Take your time and don't get deadset on a specific one until you know its the one for you. I realize there are a lot of factors, but even my '98 came along when I wasn't even looking. Did I want blue/ No, but a 6spd, low milage, and one owner sealed the deal for me, so i jumped on it. I'm glad I did. Another area of concern at least for me, is the fact you have not personally seen or driven the car. thats an area open to asking for a reduced price for the car. its shady he was not will to meet. with the title issue and the latter, doesnt it make you wonder what else he might be hiding or keeping from you? If you haven't seen the car in person how do you know it's actually his and it's not a scam? 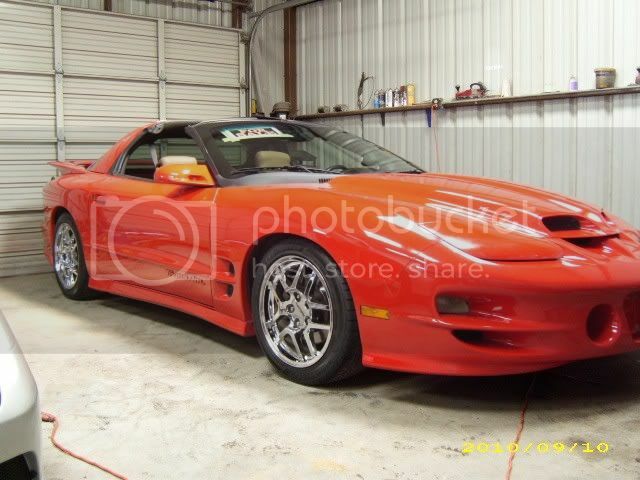 Also if you haven't seen the car in person it could actually not be a WS6, if a WS6 is what you are dead set on owning that might be a deal breaker for you. Not to mention it might not be in the condition the pictures show. I would either walk away from this and look for another one or go see it and have the guy take it to a mechanic to check it out. Also like previously stated, don't let the mileage fool you, some have low miles but were not taken care of so they have lots of problems or some have high miles and have no problems at all. I bought mine in 2007 with 125k miles on it, I have had almost no engine troubles except normal wear and tear that occurs. Last edited by 98TransAmWs-6; 09-23-2010 at 12:14 PM. I think I will wait him out until next tues or weds and if no, move on from there. If he does come thru, I will not purchase the car before seeing it. I can always take the check back to the bank and I am not afraid to walk away. I've bought and sold plenty of cars off the internet and far away classifieds. Mileage really wasn't an issue because I am going to commute in it so it will be racked up regardless. This TA will be added to my collection of cars that won't be sold and will pass on to my family upon my death type of thing. Yes it is a WS6, did a carfax and ran the RPO codes on it. I did find three red ones in New Jersey just in the last couples hours, but I couldn't afford a flight there, the drive back or schedule the time with work. I would pass this guy seems shady to me not having the title after saying he does. I would get the con and check the carfax on it for sure to make sure there isnt anything else you may find out .later. that and if he wanted to sell it but doesn't want to meet you to show it to you makes me think he is hiding something. Clear title doesn't always tell the whole.story since I could fix a.wrecked car and to anyone who.doesn't know exactly what to look.for would never know. keep an eye out 4 rust on northern or beach cars..just fyi.. I am not afraid to walk away.